To qualify for regular rates, registration forms must be sent by Sunday 20th of July – that is, sent online, faxed, or postmarked by that date. The last date to advance register by fax, e-mail, or by mail is 1st of September. After that, you can register at the Conference. It is strongly recommended that you register well in advance of the deadline. No telephone registrations will be accepted. To register offline please download the Offline Registration Form. Then you can fax, e-mail or post it to the contacts found on the right top corner of the Registration Form. All participants, including Session Chairs, and Speakers must register for the WikiSym conference. Please contact for further information if you need. WikiSym 2008 and Student registration includes admission into all WikiSym sessions, Welcome Reception, Special Event ticket, and bag with the CD Proceedings. All participants are entitled to coffee breaks and Lunch for the days as well as the tutorial notes for each Session. WikiSym One Day Only registration includes admission into all WikiSym sessions of the day, including Welcome Reception (if Monday), and and bag with the corresponding CD Proceedings. All participants are entitled to coffee breaks and Lunch for the day registered as well as the tutorial notes for each Session (if Monday). 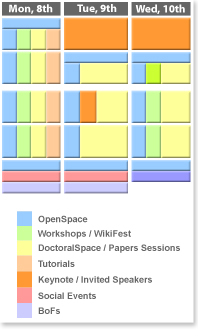 Workshop participants must contact the workshop organizers and register for the WikiSym conference or for a one-day only. Confirmation letters will be sent by email, fax or mail. Please allow up to two weeks for mailed confirmation of your registration. All registration will be processed first-come, first-served, based on date of receipt. On-site registration will be accepted subject to the availability of space and materials. 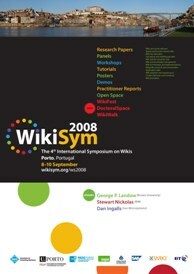 WikiSym 2008 reserves the right to limit Conference, Tutorials, Workshops and Special Event Tickets, weeks before the end of the Conference. For Wire transfers please contact registrations@wikisym.org. We will be unable to accept any other form of payment. Member fees apply to ACM and U. Porto Participants. Students must submit a letter from the Institution confirming academic status as a full time student at the time of registration. Cancellations made in writing and faxed or postmarked by the 1st of September will be accepted subject to a 60 Eur cancellation fee. Refunds will be made within 1 week of the end of the Conference. Cancellations will not be accepted after the 1st of September. Alternatively your registration may be transferred by giving a colleague a written authorisation. "No Shows" are not refundable and are liable for the full registration fee.